Please read it, and abide by it, if you choose to use this art. for use in free newsletters and free newspapers. You may make digital prints on paper, for personal use only. We feel that "working" signs, etc. for use in rallies and demonstrations are fair use also, as are signs/prints for window display and the like. 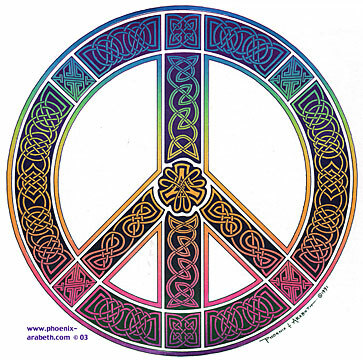 (The celtic peace symbol was designed during the first Gulf conflict.) Please put these images to work in your windows and demos NOW! However, we are clearly NOT giving away any commercial use or publication rights.... ie. you are not permitted to use these designs for any item that will be sold (even for a fund-raiser) without specific written permission from us. 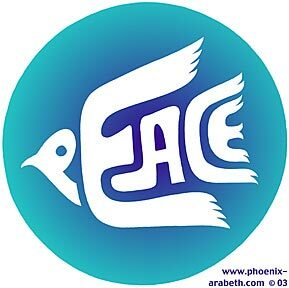 Please use them freely to promote and support peace, but not for making money. In your usage, do not remove our signature or copyrite notice as this compromises our rights. We make our living solely from our art, and the licensing of commercial reproduction rights is very important to our survival. The copyrite notice helps to protect those rights for us. If you know an appropriate someone in your region or country, who is in the business of making and distributing bumper stickers, window decals, t-shirts, postcards or posters, please tell them about our images, and put them in touch with us. Thank you. For all inquiries regarding copyrights, publishing rights, manufacturing, distribution, etc.